Retired--Now What? : Wake Up, World! Welcome back. I’m going to guess that 26 years ago you missed the “World Scientists' Warning to Humanity.” I did, or at least, I don’t remember it. The 1992 Warning was an appeal from more than 1700 of the world’s leading scientists, including most Nobel science laureates, for humans to stop inflicting harsh and often irreversible damage on the environment and critical resources. If unchecked, they wrote, we may so alter the world that it will be unable to sustain life as we know it. Led by the Union of Concerned Scientists, the short warning didn’t waste a lot of words in identifying areas that must be addressed across the spectrum of the environment--atmosphere, water resources, oceans, soil, forests, living species--and population. The scientists called, for example, for the world to cut greenhouse gas emissions and pollution of air and water, halt deforestation, reverse the trend of collapsing biodiversity and stabilize population. Well, even if you and I weren’t paying attention 26 years ago, we’ve got another wake-up call: the "World Scientists' Warning to Humanity: A Second Notice." And this time, there are a lot more people calling. Led by scientists from Oregon State University and initially signed by nearly 15,400 scientists from 184 countries, the second warning picks up where the first warning left off. 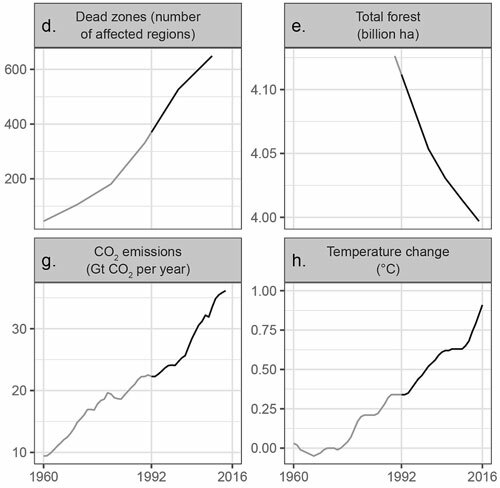 Authors of the second warning used all available data to evaluate changes over time in the specific areas identified in the first warning: gases that deplete stratospheric ozone, freshwater resources, marine catch, ocean dead zones, forest acreage, vertebrate species abundance, carbon dioxide emissions, temperature change and both human and ruminant livestock population. They found that, with the exception of one area--stabilizing stratospheric ozone, humanity has failed to make sufficient progress in addressing the challenges. All other areas have gotten worse. Among areas of special concern are the current trajectory of potentially catastrophic climate change due to rising greenhouse gases from burning fossil fuels, deforestation and the decline in species abundance. We have unleashed the sixth mass extinction event, wherein many current life forms could be annihilated or committed to extinction by the end of this century. Despite the success of lobbyists in delaying environmental progress, and in the face of the Trump administration’s actions, the authors of the second warning judge that with a groundswell of organized grassroots efforts, dogged opposition can be overcome and political leaders compelled to do the right thing. They also urge that we re-examine and change our individual behaviors. - further reducing fertility rates by ensuring that women and men have access to education and voluntary family-planning services. In response to the support the second warning generated, the authors established an Alliance of World Scientists (see P.S.). The main goal of this new assembly of scientists is to be a collective international voice of many scientists regarding global climate and environmental trends and how to turn accumulated knowledge into action. Scientists of any discipline are invited to visit the Alliance website to read and endorse the 1000-word second warning. Also available on the website are the list of the original signatories as well as a running list of subsequent endorsers.